All 18 episodes from the first season of the US hospital drama set in the emergency department of a busy Chicago medical centre. 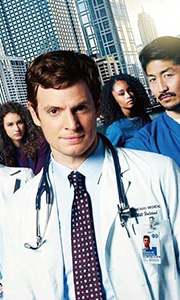 The show follows senior resident Dr Will Halstead (Nick Gehlfuss) and his dedicated team of doctors and nurses as they attempt to tackle the unique and challenging cases which occur day-to-day in their highly-pressured and unpredictable department. In this season, the staff are pushed to the limit following an..
Own Chicago Med Season 2 DVD from Deff, DVD, Blu-Ray & 4K Video Specialists - Free UK Delivery.. This season, Dr. Will Halstead (Nick Gehlfuss) has to balance the stress as the ER's supervising Attending Physician while exploring a budding romance with Dr. Natalie Manning (Torrey DeVitto), emergency pediatrics resident. Rising star heart surgeon Dr. Connor Rhodes' (Colin Donnell) skills are put to the test with the arrival of a new, highly competitive Cardiothoracic Fellow. Special Features Dubbed Languages: French..